"The team helped me a lot, did a great job to set me up at the start of the climb. It went full gas from the start and it was very hard but I think I limited the damage pretty well." "Look at us and look at other teams in the classification. Keep in mind we are 6th overall and we haven't spent any extra energy getting there." 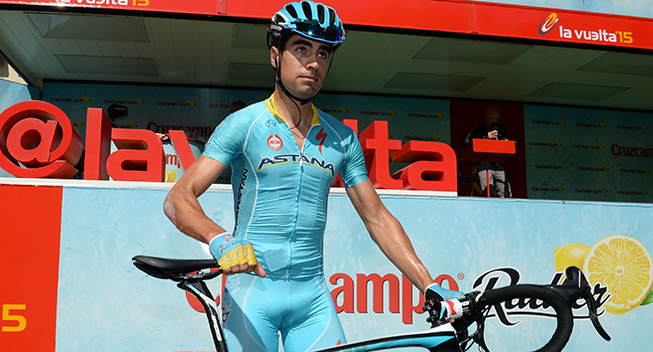 Those were the words of Astana's Diego Rosa after stage nine at the Vuelta a España. Rosa and Luis Leon Sanchez threw themselves at a combative peloton and closed a massive gap to the breakaway before an uphill finish on the part of the Spanish seacoast where cyclists go on vacation in winter . Rosa's efforts put Fabio Aru and an elite group of leaders into position for a possible victory, rather than a slow and tepid chase to preserve classification times ahead of future mountains. Thus the elite group of leaders chose to race, and spend energy, on a hot and humid stage with one more start in the morning before the rest day. Aru rode patiently at his own pace, most importantly without excessive nervous pedaling. He watched as leaders passed him going forward and again as he passed them coming back, and in the end finished 4th, 16 seconds behind stage winner and new raceleader Tom Dumoulin of the Netherlands. Overall Aru moved up from 7th to 6th, 1:17 back from Dumoulin. Rosa is 20 minutes back and will continue to work for Aru as leader.Mikel Landa finished in a group 14 minutes behind Dumoulin on Sunday. "The team helped me a lot, did a great job to set me up at the start of the climb. It went full gas from the start and it was very hard but I think I limited the damage pretty well," Aru said.